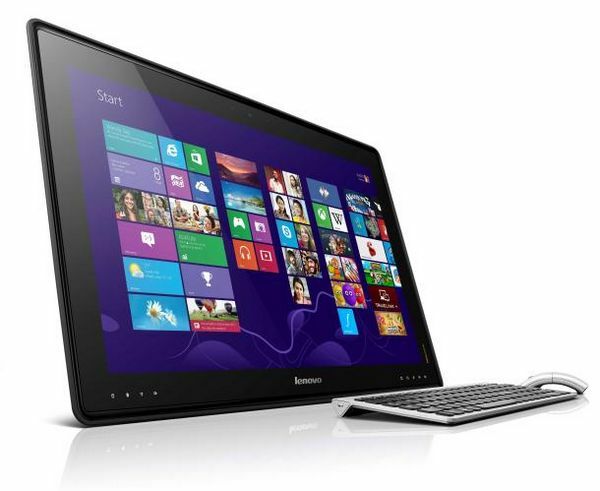 Lenovo was particularly proud of their Horizon all-in-one (AIO)/Table PC touchscreen computer, which at first glance seems much like any other AIO. Lenovo is adding their own special sauce via added software goodness to create what they hope will be a new class of device, the “interpersonal computer”. One of the main attractions besides software is that the device can lie completely flat against the table, at which point the Lenovo Auro interface activates. Auro is designed to support interaction with two or more people (10-point multitouch), allowing for a more family/group oriented experience. The Horizon comes with a variety of accessories including four joysticks, four “sliders” (think air-hockey equipment), and even a Bluetooth enabled e-dice. Much of what was shown seemed to target the gaming market with Horizon-enabled titles like Monopoly, Draw Race 2 HD, Raiding Company, and King of the Opera, but the Horizon can also function as a standard AIO. The hardware on the Horizon includes a 27” 1080p IPS display, NVIDIA GeForce GT 620M 1GB graphics, up to 8GB RAM and a 1TB hard drive (with an optional 64GB SSD), and processor support goes all the way up to Core i7. Other features include 802.11n WiFi, Bluetooth, USB 3.0, a card reader, and an integrated 720p webcam. It features a battery as well, though it only lasts up to two hours. The whole unit measures just 27mm (1.1”) thick and weighs 8.06kg (17.8 lbs). The Horizon is currently scheduled to begin shipping this summer, with a starting price of around $1699.